P.S: Here are two different takes on this recipe: with mushrooms as a main ingredient and this one with onion. What a smart idea...yum!!! It looks so inviting and warm! :) Hope you had a great weekend!! Did I tell you I tagged you in my 11 questions on my personal blog? Best dinner party app ever! Oh yum! omg, that looks amazing. i need to make that asap! I saw that on Pinterest, it looks soooooo goooood!! WOW!!! Diana that looks so good! Got to try that this week. Sima, we are planning to try it sometime this week as well:) Yum! That looks amazing and so easy to make! Such awesome idea!! Could easily be a star of a party! Looks so delicious. Will try it out for sure. Thank you for sharing. I can just feel the cheese going to my hips as I type this. Oh so yummy. That looks insanely yummy! I might have to go out to the market and whip that up tonight! Just divine! The second photo with the cheesy pulling apart spoke to me. 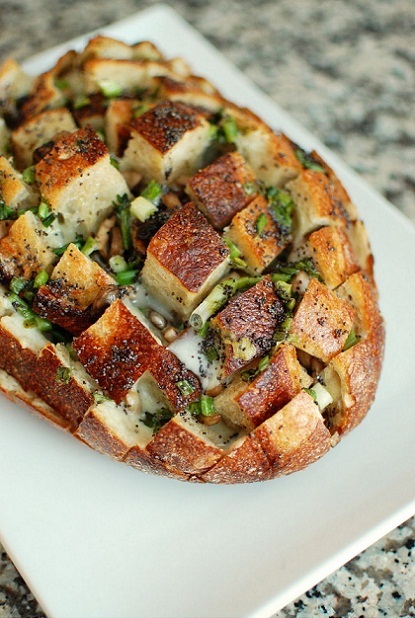 Love anything cheesy (and bread-y, for that matter). That looks like a perfect breakfast food - would love it right now! bread+ cheese= perfect combo! this is SUCH a good idea diana and something that you could whip up with whatever you have in your kitchen! thank you for sharing this fab idea! My God this looks good! I made my first resipy. It was the bread with cheese and mushrooms. We've been growing herbs but not nowing what to do with them. Now so maney have wanted the same thing. So now you can find someone that knows what to do. Thank you for sharing it was soooooo good thank you. My picky grandson even liked it. - give credit next time please. sorry didn't mean to be rude. Anonymous, at the bottom it's credited to the link that you mentioned. Yes, Melissa. You can melt the butter and add it to the mix of onion and poppy seeds or you can simply drizzle the mixed (blended) butter, onion, and poppy seeds over the bread. By adding bacon, cheddar cheese, jalepenos, and then poured ranch dressing over it . Rolled it in foil. Baked it. It was a huge hit at my house!!! Can you imagine how fast that warm, gooey bread would disappear at a tailgate? I can't wait! Oh Yummm. "what a great recipe"
Can't wait to make this!!!!! Soooo yummy looking! Going to make this for Super Bowl party tomorrow. I saw this on pinterest and headed right over to see your recipe. I think I've actually pinned it twice now. LOL. This looks like a wonderful party food that would feed a crowd (or just me). Had to stop and say hello too. Thanks a MILLION for sharing your yummy, delicious, and wonderful recipe! I tried it and all my guests "melted" over this! I was also having a bit of trouble slicing the bread. However, after slicing the bread with a bread knife, I use a scissor to cut when slicing the other way. It's easier. Yummy! I tried it the way it is in this recipe and a pizza like combination. They were both amazing, the kids loved the pizza bread, and the hubby and I loved the cheesy bread!